Above: A mission scenario of the second Soyuz rocket launch from Kourou on Dec. 16, 2011. The so-called dual-purpose Pléiades satellites were designed to provide military and civilian users with very high resolution optical imagery of the earth's surface from a 700-kilometer orbit. Covering swath width of 20 kilometers, Pléiades' photos could reveal details as small as 0.5 meters. Built by prime contractor Astrium for the French space agency, CNES, Pléiades were compact, hexagonal-shaped spacecraft with a mass of only 970 kilograms, optimized for operational agility and image location accuracy. On Jan. 4, 2005, Arianespace announced that the first Pléiades launch was targeted for 2008 with the second mission coming in 2010. 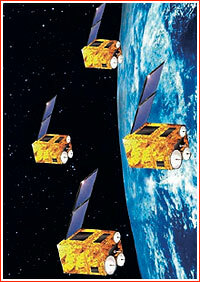 On Sept. 11, 2007, Arianespace also announced the agreement with Astrium for the launch of four ELISA satellites as secondary payloads on the same mission. By that time, the launch was expected to take place at the end of 2009 and, later slipped to April 2010. 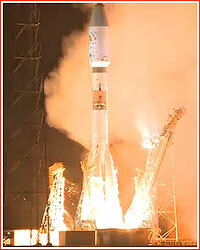 At the time, it was also expected to be the first launch of the Soyuz rocket from Kourou. During 2010, the delays in the construction of the Soyuz launch pad in Kourou delayed the mission from October of that year. The mission was finally reached the launch pad by the end of 2011 as the second Soyuz launch from Kourou. As of October 13, 2011, the delivery of the Block I upper stage for the mission was scheduled for December 6. The stage was recalled for additional checks in the wake of the Progress M-12M launch failure previous August. The Soyuz mission’s four ELISA micro-satellites are part of a joint demonstrator program involving the French DGA defense procurement organization and the country’s CNES space agency, with these spacecraft developed in a partnership of Astrium and Thales Airborne Systems. Weighing 120 kg. each, they have an operational design life of more than three years. Chile’s SSOT (Sistema satelital de Observación de la Tierra) is a dual-role military/civilian optical satellite that weighed 117 kilograms at launch, and is designed for such missions as mapping, agricultural monitoring, and the management of natural resources, disasters and risks. Built by Astrium for the Chilean armed forces, SSOT is based on the same CNES-conceived spacecraft platform as the ELISA satellites. Departing precisely at the planned liftoff time on Dec. 17, 2011, at 11:03:08 p.m. in French Guiana, the Soyuz-ST-A/Fregat performed a 3-hour, 26-minute flight to deploy its payload of the French Pléiades-1 and Chilean SSOT satellites for civilian and defense image gathering, along with four French ELISA micro-satellite demonstrators for defense-related electronic intelligence gathering (ELINT). This was Arianespace’s second mission with the Russian-built medium-lift workhorse launcher performed from Kourou, and it occurred less than two months after Soyuz’ historic maiden flight from its new launch pad in French Guiana on October 21, 2011. Designated Flight VS02 in Arianespace launcher family numbering system, the Dec. 16 mission involved four burns of Soyuz’ Fregat upper stage, which enabled the six satellites to be released for operations at altitudes ranging from 610 to 700 kilometers. Using a new purpose-built payload dispenser developed for Arianespace’s Soyuz missions, the deployment sequence began with the release of Pléiades 1. It was followed by the simultaneous separation of all four ELISA satellites, and the mission was completed with the deployment of SSOT, which occurred three hours, 26 minutes after liftoff. The Soyuz lift performance was an estimated 2,190 kilograms, which includes approximately 1,400 kilograms for the Pléiades 1, ELISA and SSOT satellites, along with the weight of its payload dispenser and integration hardware. This was the 1,781st flight of the Soyuz launcher family, which ushered in the space age. 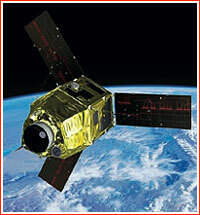 As of Jan. 4, 2005, the second launch of Pléiades satellite, designated Pléiades-1B, was expected in 2010, however by that year it slipped to mid-2011. By the end of 2011, the mission was expected at the end of 2012. On October 25, Arianespace announced that the spacecraft for the mission, designated VS04, was delivered to Cayenne, French Guiana, onboard a Boeing-747 cargo aircraft. At the time, the launch was planned for November 30. According to Arianespace, Pléiades-1B was designed to provide optical observation coverage with 50-centimeter resolution for the French and Spanish defense ministries, civil institutions, and private users. It was to be inserted into a 695-kilometer quasi-polar heliosynchronous orbit. In preparation for the mission, the Soyuz-ST-A/Fregat launch vehicle was rolled out to the launch pad on November 26, 2012. The mission – designated VS04 in the Arianespace’s launcher family numbering system – was set for liftoff at exactly 11:02:50 p.m. local time in French Guiana. However around 30 minutes before liftoff, the launch was postponed by at least 24 hours due to problems with the launch vehicle's flight control system. Specialists had to replace coordinating and commutation device, known as SKU, where one of three operational channels apparently failed. 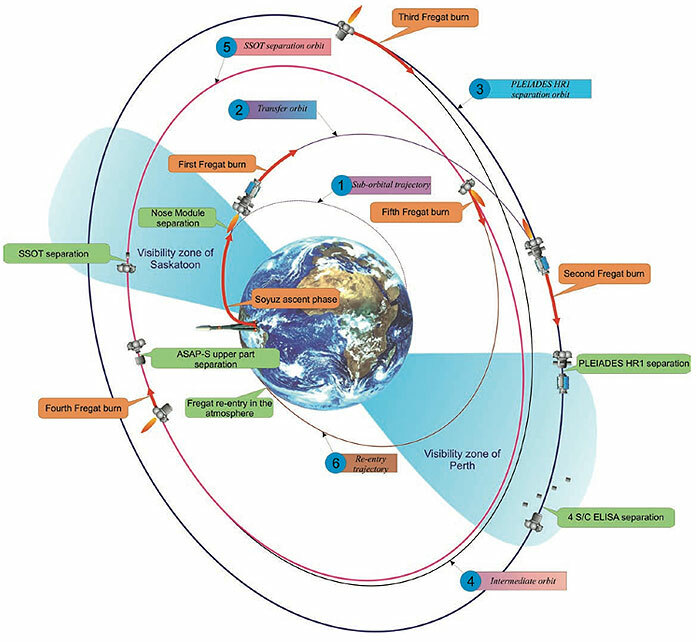 On Dec. 1, 2012, the launch took place as scheduled and the payload section reached orbit flawlessly. Following liftoff from the Guiana Space Center, the powered phase of the lower three Soyuz stages was to last about nine minutes. The third stage of the launcher will then be separated from the upper composite, comprising the Fregat upper stage and the Pléiades 1B satellite. The three lower stages will fall back into the sea. According to Arianespace, during this flight, the Soyuz was carrying an estimated 1,070 kilograms of cargo, which included the 970-kilogram Pléiades-1B satellite.